You can collaborate on an item in real-time with your team; multiple people can edit content at the same time and see everyone's changes instantly. When on an item, simply click into a field to begin adding content. If anyone else is editing the item, you'll see their circular avatar shown at the top right. 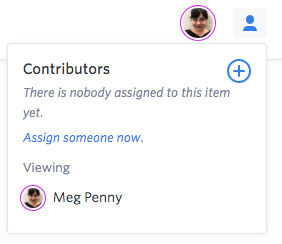 The coloured circle around their avatar will also be visible by their pointer, which will show that person's location on the page, so you can keep track of any edits they're making. Edits to the content will be shown in real-time, so you may notice the item changing whilst you and your team work on it! Tip: Can't add content? Get someone to double check that your role permissions include the ability to write and edit content.